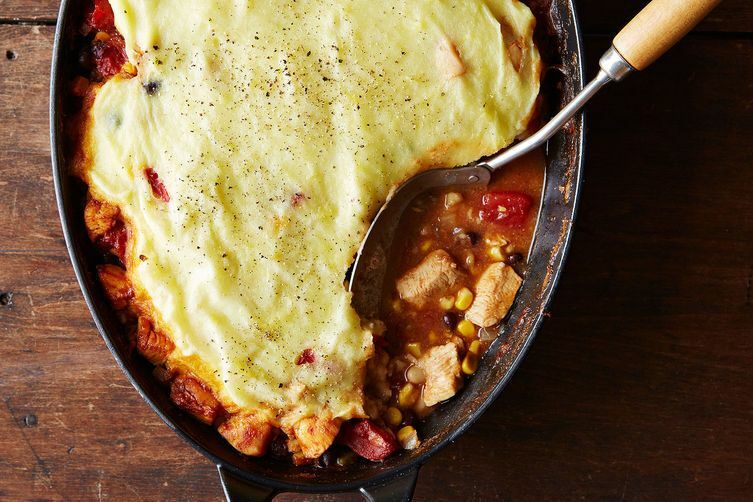 Today: A hearty, one-pot dinner that's basically Mexican shepherd's pie. Because my dad could not stop calling it "mexi-quiche,"
Today we make tamale pie. made it tonight; delicious. Didn't need to add the chicken broth. Used leftover roast chicken, about 2 cups leftover beans from freezer and what was left in the frozen corn pkg. Topped with avocados, sour cream and shredded cheese. Lots of leftovers. Looks like many happy family meals from my youth, Sunset Magazine would always use Cambell's Tomato soup for that special flavor we all loved in those days. How do I print the recipe?? Cathy, if you click on the recipe name which is a link, then there is an option on the top left of the food image (to the right of the heart and save icons) to click to print. Add some mexican spice like cumin and chills to the mix for the crust. A squirt or two of lime juice will brig ten the whole meal up! Kendra, can you please add sizes for the cans of beans and corn? This looks delicious. I'll definitely be making this for dinner one night.